QUÉBEC, July 7. 2016 / (Translation by the Foundation) / – On behalf of the Minister of Health and Social Services, Mr. Gaétan Barrette, MP for Huntingdon and Chief Whip of the Government of Quebec, Stéphane Billette, announced a total investment of $2 218,040 for major renovations at the Barrie Memorial Hospital, a facility of the Centre intégré de santé et de services sociaux (CISSS) de la Montérégie-Ouest. “The hospital was built over 75 years ago, will be renovated to ensure the welfare and safety of patients and staff. The entire community will benefit from this project. Providing modern infrastructures within our health and social services institutions of is one of the government’s priorities, especially regarding fire safety and hygiene care, “said the MP. The Ministry of Health and Social Services is investing $1,223,540 for this project. The remaining costs will be borne by the institution, to the tune of $509,500 and by the Barrie Memorial Hospital Foundation, for an amount $485,000. 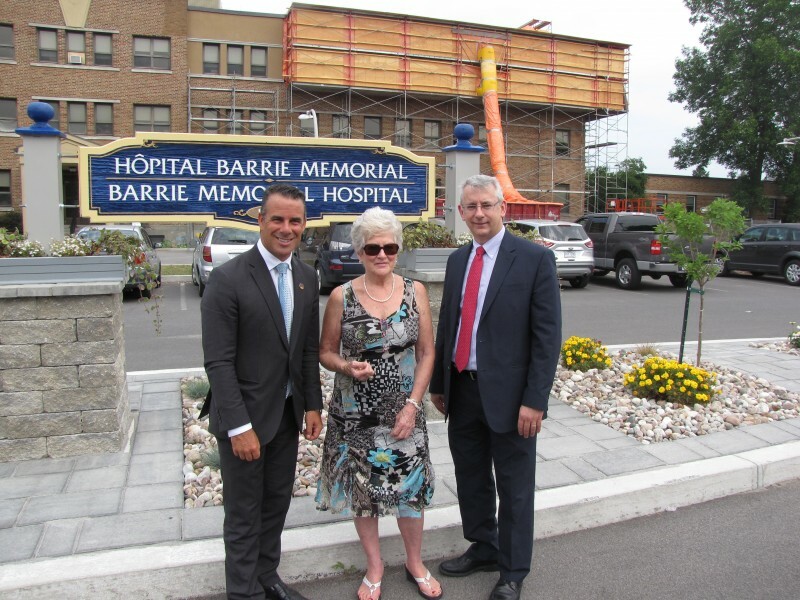 “The Barrie Memorial Hospital Foundation is very proud to contribute to the financing of this project that will benefit the users and employees, who mostly reside in our community. The objective of the Foundation has been investing in the community, for the community” added the Chair of the Foundation, Mrs. Madeleine H. Greig. The work, which began in early June, focuses to ensure sanitary conditions and patient safety. The work entails the restoration of the exterior of the 3rd floor, replacing the nurse call system, the installation of a wandergard system, installing three patient lifts on rails and installing sprinklers. The central sanitary utility block will be refurbished as well. Finally, access to emergency services for ambulances and ambulatory patients will not be affected during the construction period. Only a few parking spaces at the front of the hospital will be inaccessible from the start of work until the beginning of August. The work should be completed in the winter of 2017.